My brother, Royce, and I had arranged to meet in the nice garden behind Notre Dame cathedral at 10 this morning. This worked like a charm and just before 10 there we were sitting on a bench under some trees in a light drizzle catching up on how each other’s holidays were going. We had another walk around the inside of the cathedral then as we were deciding what to do next I got a call from my friend Jenny from Holland who had driven down to catch up with me. They had booked a hotel across the road so we headed back and found them at a nearby cafe where we enjoyed a coffee and another catch up. 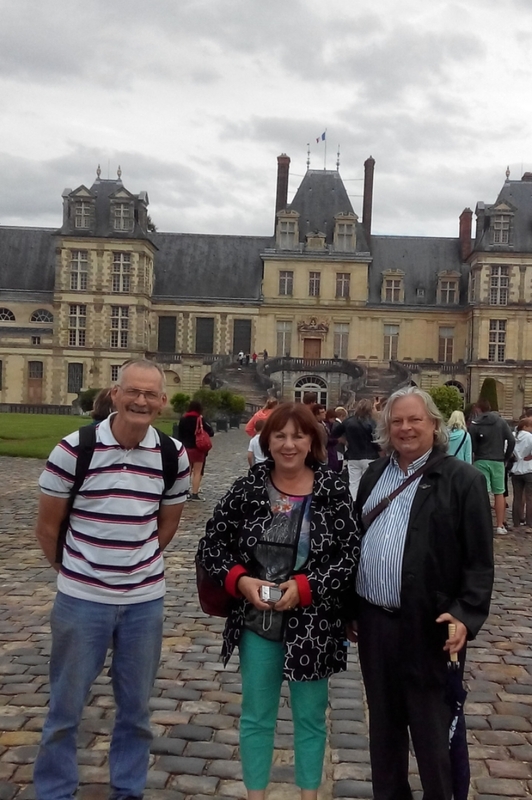 Hein offered to drive us somewhere so we headed off to Fontainebleau palace about an hour and a half away. The palace is a pretty impressive place with one section devoted to stuff from Napoleon iii and amazingly decorated rooms from earlier including a room and bed designed for Marie Antoinette. There is so much gold leaf guilding almost every room, and so many rooms that one becomes almost bored with what is unbelievable luxury. Good to hear that you have caught up with Royce and your friends. What an amazing place that palace must be! Not long now and you will be winging your way home.